On the upside, online video marketing is accessible to marketers with any size budget. On the downside, online video marketing is accessible to marketers with any size budget. TV advertising, with its bigger budget and (sometimes but not always) more consistent and trustworthy content, is a bigger investment. 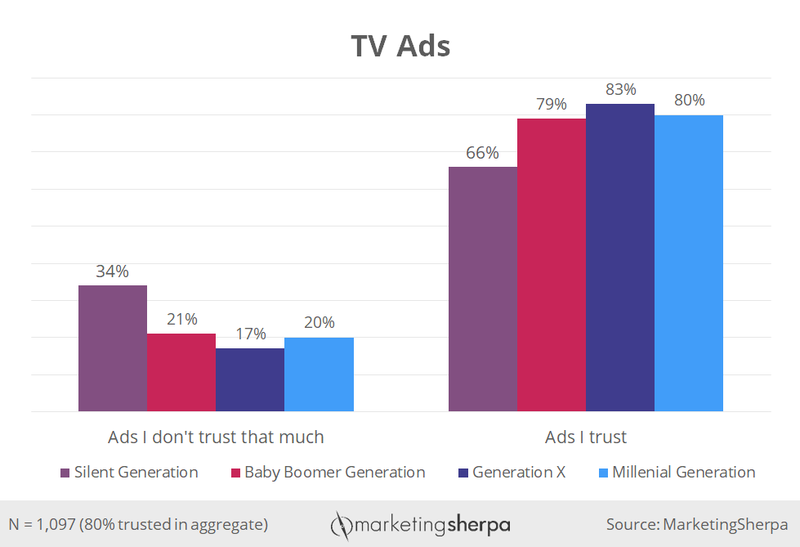 However, it gives digital marketers the opportunity to have a more trustworthy conversation, even more so for specific age groups, which we explore in this week’s article about how much millennials, Gen X, and other age groups trust TV ads when making a purchase decision. When we researched which type of advertising channels customers trust most when they want to make a purchase decision, television advertising was the second most popular channel, following only print advertising. In general, which type of advertising channels do you trust more when you want to make a purchase decision? Please sort the options into “Ads I trust” and “Ads I don’t trust that much” categories. Overall, four out of five Americans (80%) trust television ads. “Despite the evolution of the media landscape, this is an indication of the enduring power of television, its ability to capture attention and persuade,” Suzanne Zellner, Vice President, Corporate Sponsorship, Sponsorship Group for Public Television, told me when I asked her perspective on this data. Now let’s take a closer look at how this trust varies by age group. As a member of Generation X, I can tell you how we are often overlooked. There are now more millennials than baby boomers, and both are larger than Gen X. How ironic, then, that according to our latest data, Generation X is actually the least skeptical generation of television advertising when making a purchase decision, with 83% of Gen Xers saying that TV ads are “ads I trust” (with millennials and baby boomers not far behind, and the Silent Generation trailing the pack as the most skeptical generation in this case). This is good news for marketers and brands, because, as I was reminded while watching Pearl Jam get inducted into the Rock and Roll Hall of Fame, we in Generation X are no longer alternative. Many of us are no longer single. And reality no longer bites. We are now established. In fact, according to research by American Express, Generation X now has more spending power than any other generation, with 31% of total income dollars. Yes, they trust TV ads. But if they’re watching less TV, it means less opportunities to catch their attention. So it’s even more important to understand their viewing habits. Television networks, media buying agencies and research firms will, of course, give you tons and tons of sliced and diced TV viewing habit data. However, it doesn’t hurt to ask your ideal customers as well. Listen in to their conversations on social media and in forums. Or ask them in surveys, at events or through in-person conversations. Make sure you’re not only on the lookout for what they watch but also what they trust. When will they be in the right frame of mind to receive and believe a message about your product? “The key to capitalizing on TV’s trust potential is to align with content that viewers believe is trustworthy, especially in the current environment. While PBS [Public Broadcasting Service] doesn’t accept advertising, rather corporate sponsorship messaging, our research shows that there is a strong correlation between trust in content, viewer trust in the sponsor/advertiser, and the impact on intent to purchase,” Zellner said. In addition to trusting the message more on a trusted show, customers have become increasingly savvy to the fact that your brand is essentially supporting whatever television programs are adjacent to your marketing messages, especially in the current political environment. Some customers overtly boycott brands that support TV programming that goes against their values, and it’s likely that many more subconsciously develop a negative association with a brand that supports TV programming that goes against their personal grain. This is another reason why it’s so important to listen to your customers and build a customer theory to inform your media buys. General viewership data is not enough. You need to understand your brand’s value proposition, your ideal customers’ values, and plan your media buys accordingly and not simply buy only to get in front of as many people in a targeted demographic as possible. You need the right message to the right people aligned with the right program. After all, you’re not just buying eyeballs, you’re buying hearts and brains as well. You don’t just want your ideal customer to see a TV ad, you want them to go on a journey (fraught with potential risk, especially for high-dollar decisions) with you that ultimately ends in a purchase. No easy task. But when you do it right, you produce a halo effect for your brand. 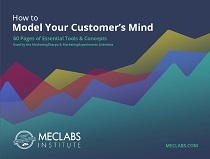 “It’s a demonstration of ‘customer-first’ marketing: align with content that your customers tell you they value, and they will support your brand,” Zellner said.